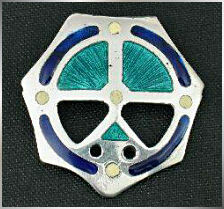 Convex silver enamelled disc brooch by Alexander Ritchie. Reverse is hallmarked for Birmingham 1935 and has marks AR and ICA around the edge. Very art deco-style design yet merging perfectly with the ornate designs on early medieval Iona stone carvings.